I'm very happy to say Nicole Lancaster is the winner of one Princess Faith Sticker and Activity Book. (You'll find my full review at thislink.) Thank you Nicole for reading grandma's cookie jar (please email me your address by May 19, 2015 so I can have it sent it to you - lyndagcj@gmail.com)! 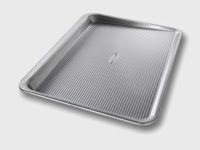 I'm also happy to say in two days, on May 14, 2015 I'm giving away one USAPan Scoop Sheet Pan. This is really a great pan - I love the one I have and use it often! You will find all the details for the give-away at this link - but the important thing is you still have time to enter the drawing for this give-away - who knows???!!! Maybe you will win!